Track Malaysia Post shipment online.Malaysia Post tracking system . You can get the tracking number from the voucher of Malaysia Post,which would be given to you at the time of booking. Tracking Malaysia Post shipment here is very simple ,just put the tracking no here in box and press the track button. It will bring you to the official site and show the immediate tracking result . 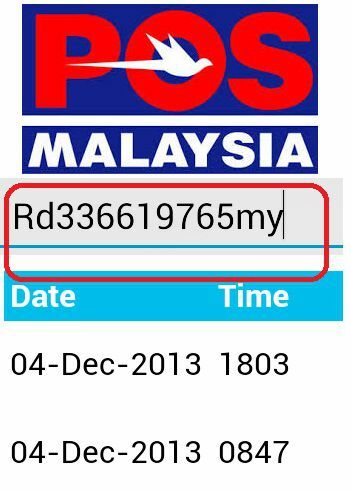 The most common tracking number format of Malaysia Post is combination of 13 alphabetic and numeric characters, usually starting 2 alphabetic characters, following by 9 digits, and ending by “MY” (e.g. EF 111 111 111 MY). There are some other format also which can be track in the same way. After pressing the track button ,you will be taken to the tracking result page of official Malaysia Post site. www.pos.com.my. www.Trackmypacks.com provides free and fast tracking services of post/ems,cargo,container and all international express carriers. Pos Malaysia Berhad is a post services company in Malaysia. The organisation was restructured in 1992 from being a governmental owned Malaysian Postal Services Department or Jabatan Perkhidmatan Pos Malaysia into a business corporation. Pos Malaysia provides postal and related services, transport logistics, printing and insertion, counter collection and payment agency services for a range of financial transactions, such as bill payments, remittance, insurance and unit trusts. The company holds an exclusive concession to provide mail services through its network of over 850 branches and mini post offices in Malaysia. Labels: malaysia post tracking registered mail, poslaju malaysia tracking, china post tracking malaysia, tracking poslaju malaysia,post malaysia tracking, malaysia tracking, malaysia post track, post tracking malaysia, malaysia post tracking number, post malaysia track, malaysia post tracking registered post, registered post tracking malaysia, malaysia tracking number, registered post malaysia tracking, track poslaju malaysia, speed post malaysia tracking, malaysia mail tracking, malaysia parcel tracking, malaysia tracking mail, poslaju malaysia track.